In architecture, functionalism is the principle that architects should design a building based on the purpose of that building. This statement is less self-evident than it first appears, and is a matter of confusion and controversy within the profession, particularly in regard to modern architecture. Functionalism had the strongest influence in Germany, Czechoslovakia, the USSR and the Netherlands. The place of functionalism in building can be traced back to the Vitruvian triad, where 'utilitas' (variously translated as 'commodity', 'convenience', or 'utility') stands alongside 'venustas' (beauty) and 'firmitas' (firmness) as one of three classic goals of architecture. Functionalist views were typical of some gothic revival architects. In particular, Augustus Welby Pugin wrote that "there should be no features about a building which are not necessary for convenience, construction, or propriety" and "all ornament should consist of enrichment of the essential construction of the building". The debate about functionalism and aesthetics is often framed as a mutually exclusive choice, when in fact there are architects, like Will Bruder, James Polshek and Ken Yeang, who attempt to satisfy all three Vitruvian goals. In 1896, Chicago architect Louis Sullivan coined the phrase 'form ever follows function' to capture his belief that a building's size, massing, spatial grammar and other characteristics should be driven solely by the function of the building. The implication is that if the functional aspects are satisfied, architectural beauty would naturally and necessarily follow. Sullivan's credo is often viewed as being ironic in light of his extensive use of intricate ornament, since a common belief among functionalist architects is that ornament serves no function. The credo also does not address whose function he means. The architect of an apartment building, for instance, can easily be at cross-purposes with the owners of the building regarding how the building should look and feel, and they could both be at cross-purposes with the future tenants. Nevertheless, 'form follows function' expresses a significant and enduring idea. Sullivan's protégé Frank Lloyd Wright is also cited as an exemplar of functional design. In the mid-1930s, functionalism began to be discussed as an aesthetic approach rather than a matter of design integrity. The idea of functionalism was conflated with lack of ornamentation, which is a different matter. It became a pejorative term associated with the most bald and brutal ways to cover space, like cheap commercial buildings and sheds, then finally used, for example in academic criticism of Buckminster Fuller's geodesic domes, simply as a synonym for 'gauche'. For 70 years the preeminent and influential American architect Philip Johnson held that the profession has no functional responsibility whatsoever, and this is one of the many views today. Johnson said, "Where form comes from I don’t know, but it has nothing at all to do with the functional or sociological aspects of our architecture". The position of postmodern architect Peter Eisenman is based on a user-hostile theoretical basis and even more extreme: "I don't do function." Popular notions of modern architecture are heavily influenced by the work of the Franco-Swiss architect Le Corbusier and the German architect Mies van der Rohe. Both were functionalists at least to the extent that their buildings were radical simplifications of previous styles. In 1923 Mies van der Rohe was working in Weimar Germany, and had begun his career of producing radically simplified, lovingly detailed structures that achieved Sullivan's goal of inherent architectural beauty. Le Corbusier famously said "a house is a machine for living in"; his 1923 book Vers une architecture was, and still is, very influential, and his early built work such as the Villa Savoye in Poissy, France, is thought of as prototypically function. 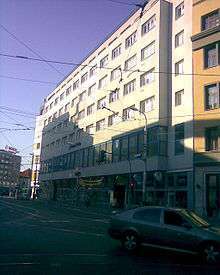 Functionalism was a dominant architectonic style in former Czechoslovakia in the period of 1928-1970 (with an exception of the occupation and a Stalinist architecture in 1950s). It was a result of fascination first by industrial development and later by an effort "to create a new man and new society" during the period of the socialism (1948–89). Its "program" was formulated by the Club of architects in Prague in 1924. In 1930s and then in 1960s and 1970s the position of functionalism was dominant and almost exclusive. 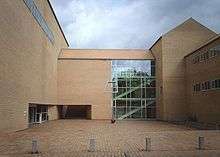 The term Danish Functionalism is sometimes used to describe the Danish branch of functionalistic architecture which had its heyday in the 1960s. Danish Functionalists focused primarily on functionality at the expense of aesthetics and produced a number of buildings that are characterized by straight angles, flat roofs, were characteristic of Brutalist architecture by virtue of the minimally decorated concrete slabs that the buildings themselves are made of. A fine example of the Danish Functionalist style is Aarhus University designed by the architect C. F. Møller. Danish architects such as Kaare Klint and Arne Jacobsen extended their approach to the furniture now known as Danish modern. The residential area of Södra Ängby in western Stockholm, Sweden, blended a functionalist or international style with garden city ideals. Encompassing more than 500 buildings, it remains the largest coherent functionalistic villa area in Sweden and possibly the world, still well-preserved more than a half-century after its construction 1933–40 and protected as a national cultural heritage. Zlín is a city in Czech republic which was in 1930s completely reconstructed on principles of functionalism. In that time the city was a headquarters of Bata Shoes company and Tomáš Baťa initiated a complex reconstruction of the city which was inspired by functionalism and the Garden city movement. Zlín's distinctive architecture was guided by principles that were strictly observed during its whole inter-war development. Its central theme was the derivation of all architectural elements from the factory buildings. The central position of the industrial production in the life of all Zlín inhabitants was to be highlighted. Hence the same building materials (red bricks, glass, reinforced concrete) were used for the construction of all public (and most private) edifices. The common structural element of Zlín architecture is a square bay of 20x20 feet (6.15x6.15 m). Although modified by several variations, this high modernist style leads to a high degree of uniformity of all buildings. It highlights the central and unique idea of an industrial garden city at the same time. Architectural and urban functionalism was to serve the demands of a modern city. The simplicity of its buildings which also translated into its functional adaptability was to prescribe (and also react to) the needs of everyday life. The urban plan of Zlín was the creation of František Lydie Gahura, a student at Le Corbusier's atelier in Paris. Architectural highlights of the city are e.g. the Villa of Tomáš Baťa, Baťa’s Hospital, The Grand Cinema or Baťa's Skyscraper. The development of functionalism in landscape architecture paralleled its development in building architecture. At the residential scale, designers like Christopher Tunnard, James Rose, and Garrett Eckbo advocated a design philosophy based on the creation of spaces for outdoor living and the integration of house and garden. At a larger scale, the German landscape architect and planner Leberecht Migge advocated the use of edible gardens in social housing projects as a way to counteract hunger and increase self-sufficiency of families. At a larger scale, the Congrès International d'Architecture Moderne advocated for urban design strategies based on human proportions and in support of four functions of human settlement: housing, work, play, and transport. ↑ A.W.N.Pugin, The true principles of pointed or Christian architecture : set forth in two lectures delivered at St. Marie's, Oscott. ↑ Andrew Hollingsworth, Danish Modern, 2008, Gibbs Smith, p. 31. ↑ Detailed references listed in the article on Södra Ängby. Vers une Architecture and Villa Savoye: A Comparison of Treatise and Building - A multipart essay explaining the basics of Le Corbusier's theory and contrasting them with his built work. Forty, Adrian (2000). "Function". Words and Buildings, A Vocabulary of Modern Architecture. Thames & Hudson, p. 174-195. Wikimedia Commons has media related to Functionalist architecture.